Abz Shafiq of Barnack is bowled by Patrick Brown of Market Deeping in the Burghley sixes. Photo: James Biggs. Holders Oundle delivered a serious statement of intent on opening night of the Burghley Park sixes last night (July 2). The Northants Premier Division side smashed 109 from their five overs against Empingham, losing just one wicket on the way. George Holmes batting for Burghley Park in the Burghley sixes. Photo: James Biggs. Club captain Mark Hodgson finished unbeaten on 54 before Empingham laboured to 65-3 in reply. Oundle will now play Barnack in a Wednesday (July 4) quarter-final. Barnack were involved in the best finish of opening night pipping Market Deeping by one run despite the presence of Worcestershire first-class player Patrick Brown. 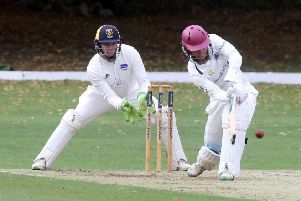 Seam bowler Brown claimed one inexpensive wicket and almost got Deeping home with the bat striking the first two balls of the final over for four when 18 runs were required. But the run out of Dan George for 44 proved crucial and Brown was unbeaten on 21 at the close. Conor Craig batting for Oundle in the Burghley sixes. Photo: James Biggs. Deeping’s overseas star Sachithra Perera took a wicket with each of his first two balls on his way to remarkable sixes figures of 2-2. The Sri Lankan leg spinner was awarded the ‘champagne moment of the night’ prize for his efforts. Hosts Burghley Park were comfortable winners over Ketton Sports in the final match of the night after racking up 95-3. OUNDLE 109-1 (M. Hodgson 54no, C. Craig 41) beat EMPINGHAM 65-3 (T. Cooper 44no). BARNACK 74-4 (S. Perera 2-2) beat MARKET DEEPING 73-3 (D. George 45, P. Brown 21no). BURGHLEY PARK 95-3 (G. Holmes 24no) beat KETTON SPORTS 74-2 (J. Mathys 28) by 21 runs. Tonight’s first round ties: Nassington v Bourne, Uppingham v Market Overton, Castor v Oakham.